Confluence Academy’s South City location serves students from grades 3 through 8. Directly behind the Academy is Providence Place, a street with 7 homes that adjoins the back side of the entire length of the building. The entire block along Providence Place had a "double row" of sidewalks that were old and cracked. There was also an original old 35 foot long driveway that had settled over the years. Patches from years ago had worn and also needed repair or replacement. In the “old days”, the drive was used to access a grease dumpster which was located there. Pumps in the kitchen of the School would send the old grease through a series of pipes which dumped into this container. Rather than replace the sidewalks that were cracked, and to replace or re-patch the old driveway, a “green solution” was called for. One row of the "double row" of sidewalks was removed entirely. 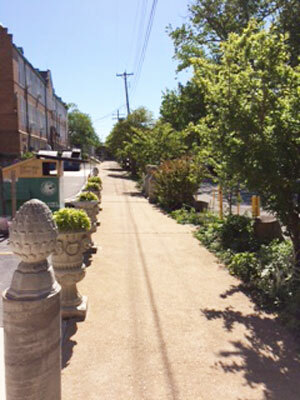 Sidewalk areas that were in need of replacement were replaced. The old driveway was removed entirely and the curb was replaced. Collaborators include: Confluence Academy South City Campus, the building occupant; St. Anthony of Padua Catholic Church, the owner of the property; Residents on Providence Place; St. Louis City Alderwoman Cara Spencer; and Holloran Contracting who did the sidewalk removal and replacement. 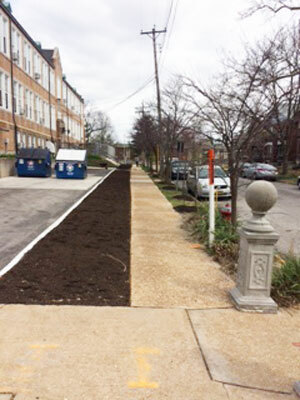 The project included: removal of 325 feet of concrete sidewalk and driveway, which is an entire City block; placement of 20,000 lbs of topsoil; replacement of 35 feet of sidewalk area and curb where the driveway used to be; and 2 truckloads of mulch. 20 trees will be planted in Spring 2018, which will create a “boulevard” or “canopy” of trees for those walking on the sidewalk. The City of St. Louis has this included as a featured project for sustainability. Terry Hammer, the owner of St. Louis-based ShopLicensePlates.com, provided the funding for this project and will handle the ongoing maintenance and planting that will be needed.